This is part of a compensated campaign with Latina Mom Bloggers and MilkPEP. However, all opinions expressed are my own. How much milk do you drink? The #HerenciaLeche campaign got me thinking about the amount of milk I’m not currently drinking or motivating my kids to drink. My husband is a milk fanatic. My Abuelita used to say ‘tomate la leche mijitaaa’ – and I would abide but it’s just not my favorite plain on its own. When I go to Katherine’s house I realize how much milk her kids drink and I started wondering how much do I offer my kids? I do love milk-based products from cheese to yogurt and of course smoothies- my ultimate favorite. I noticed in the morning I wasn’t offering my girls enough milk and this needed a change. At night I have started having a warm glass of milk and it does help me relax. For afternoon snacks, I’m including a glass of milk. 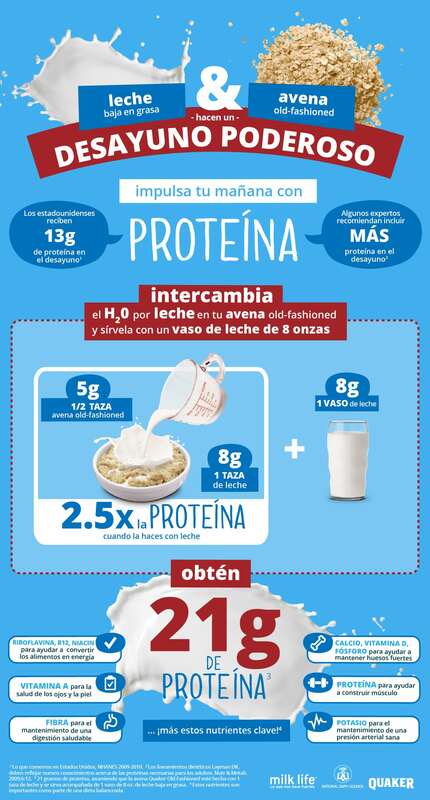 Do you know that a glass of milk offers 8 grams of protein? It is an excellent protein support especially for active kids in sports like my daughters who swim nearly two hours daily. During this weekend’s sleepover, I offered the group of tween girls homemade brownies and a glass of milk instead of ice cream or a sugary drink. I was surprised how nearly a gallon of milk was gone instantly. How are you incorporating more milk in your family’s meals? 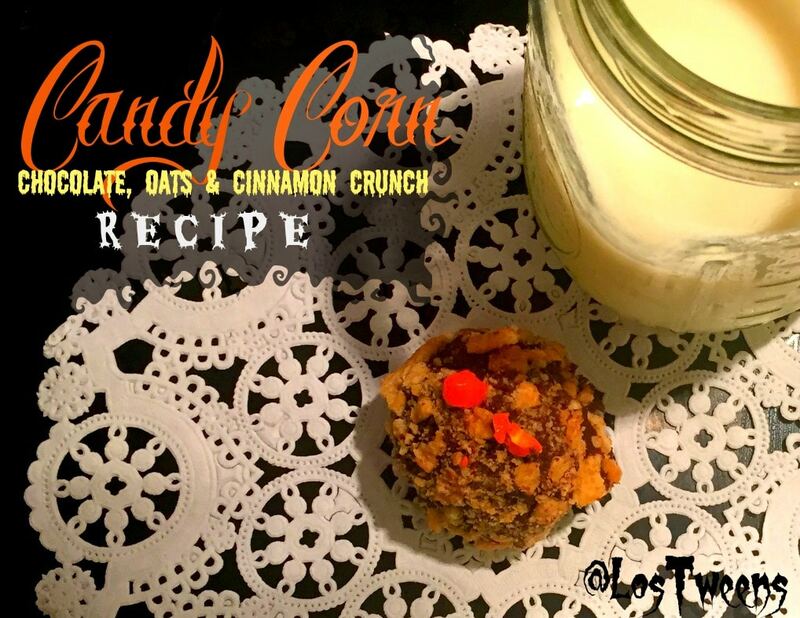 See Katherine’s recipe for No-Bake Candy Corn, Chocolate and Oats Balls below and let us know what great recipes you’ve come up with! 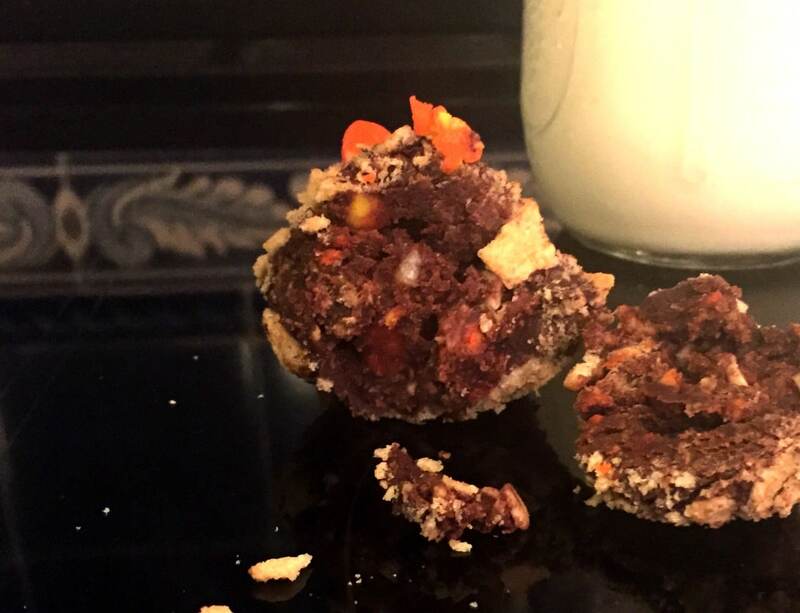 What do you get when you mix candy corn, chocolate, Quaker oats, peanut butter and cinnamon crunch cereal together? A delicious Halloween treat that the kids (and adults) will absolutely love! The recipe is a spin on the Oats, Cacoa and Dulce de Leche balls you can find on the https://fuertesconleche.com/ and http://www.quakeroats.com/espanol/ sites. I love that this recipe has oats since I put oats in almost everything – meat loaf, cookies, homemade granola…the list goes on! I also decided to go with peanut butter instead of dulce de leche to give an extra pack of protein on top of the milk and oats. It makes a perfect pre-trick or treating dessert! I started out with the basic recipe and added a little bit of butter to give it a smoother consistency. The chopped pieces of candy corn are a fun surprise and you could also keep the candy corn whole and hide a few within each ball! 2. Mix cocoa, Quaker oats, peanut butter, milk, butter and sugar to form a smooth paste. Add more milk if needed. 3. 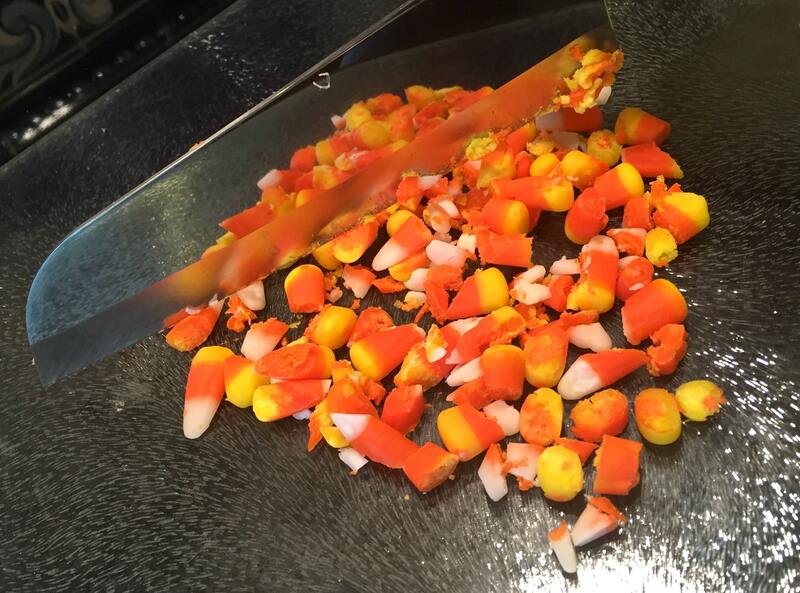 Mix in candy corn. 4. Using the paste, form balls and roll through the melted chocolate to cover. 5. Roll the chocolate covered balls in the cinnamon cereal and place on the cookie sheet. 6. Refrigerate for 10 minutes or until chocolate has set. 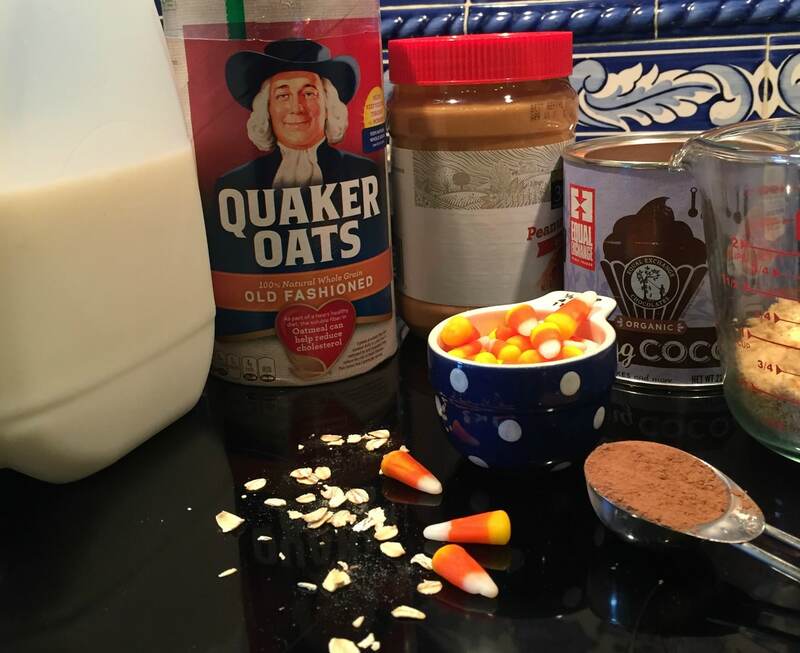 Be sure to serve your No-Bake Halloween Candy Corn, Chocolate, Oats Balls with a tall glass of milk! It’s the perfect accompaniment for the rich, creamy inside and cinnamon crunchy outside. This entry was posted in halloween, Recipes and tagged candy corn, chocolate, Family, Halloween, healthy, milk, Quaker oats, recipe. Bookmark the permalink.